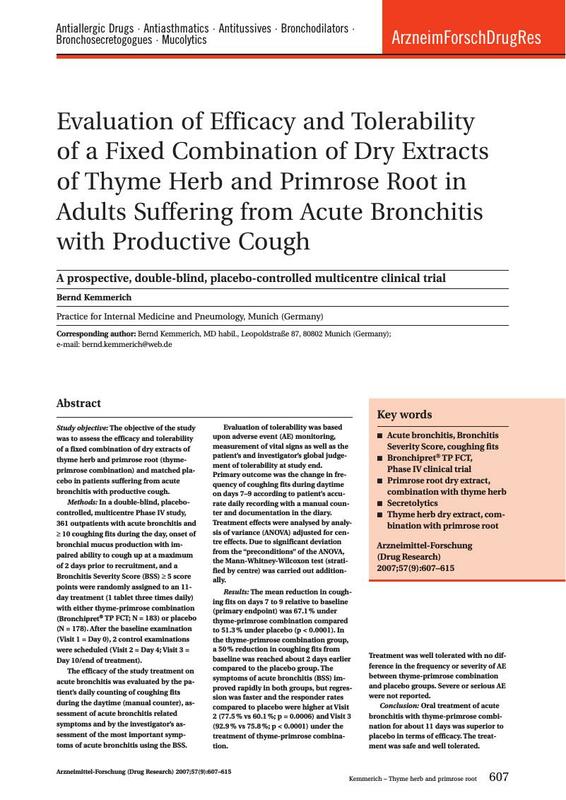 Study objective: The objective of the study was to assess the efficacy and tolerability of a fixed combination of dry extracts of thyme herb and primrose root (thyme-primrose combination) and matched placebo in patients suffering from acute bronchitis with productive cough. Methods: In a double-blind, placebo-controlled, multicentre Phase IV study, 361 outpatients with acute bronchitis and ≥ 10 coughing fits during the day, onset of bronchial mucus production with impaired ability to cough up at a maximum of 2 days prior to recruitment, and a Bronchitis Severity Score (BSS) ≥ 5 score points were randomly assigned to an 11-day treatment (1 tablet three times daily) with either thyme-primrose combination (Bronchipret® TP FCT; N = 183) or placebo (N = 178). After the baseline examination (Visit 1 = Day 0), 2 control examinations were scheduled (Visit 2 = Day 4; Visit 3 = Day 10/end of treatment). The efficacy of the study treatment on acute bronchitis was evaluated by the patient’s daily counting of coughing fits during the daytime (manual counter), assessment of acute bronchitis related symptoms and by the investigator’s assessment of the most important symptoms of acute bronchitis using the BSS. Evaluation of tolerability was based upon adverse event (AE) monitoring, measurement of vital signs as well as the patient’s and investigator’s global judgement of tolerability at study end. Primary outcome was the change in frequency of coughing fits during daytime on days 7–9 according to patient’s accurate daily recording with a manual counter and documentation in the diary. Treatment effects were analysed by analysis of variance (ANOVA) adjusted for centre effects. Due to significant deviation from the “preconditions” of the ANOVA, the Mann-Whitney-Wilcoxon test (stratified by centre) was carried out additionally. Results: The mean reduction in coughing fits on days 7 to 9 relative to baseline (primary endpoint) was 67.1 % under thyme-primrose combination compared to 51.3 % under placebo (p < 0.0001). In the thyme-primrose combination group, a 50 % reduction in coughing fits from baseline was reached about 2 days earlier compared to the placebo group. The symptoms of acute bronchitis (BSS) improved rapidly in both groups, but regression was faster and the responder rates compared to placebo were higher at Visit 2 (77.5 % vs 60.1 %; p = 0.0006) and Visit 3 (92.9 % vs 75.8 %; p < 0.0001) under the treatment of thyme-primrose combination. Treatment was well tolerated with no difference in the frequency or severity of AE between thyme-primrose combination and placebo groups. Severe or serious AE were not reported. Conclusion: Oral treatment of acute bronchitis with thyme-primrose combination for about 11 days was superior to placebo in terms of efficacy. The treatment was safe and well tolerated.